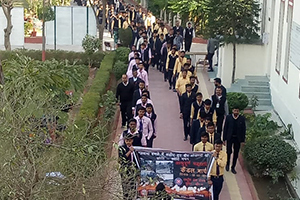 The Rajasthan Institute of Engineering & Technology paid homage to the Pulwama attack martyrs on 18.2.19. 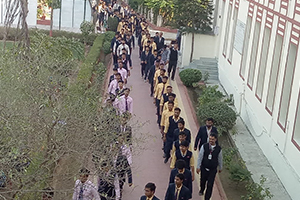 A peace march was taken out by all the students and all the faculty members of RIET. 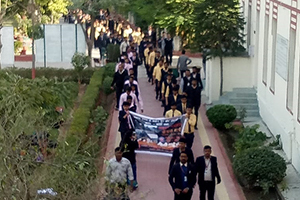 The march started from the college and went around the Bhankrota area. 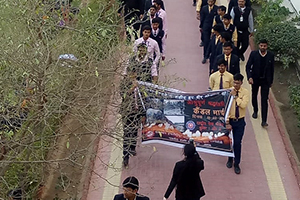 The students hailed slogans in the memory of the martyrs. 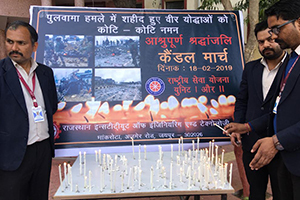 The incident was, on 14 February 2019, a convoy of 78 vehicles transporting more than 2,500 Central Reserve Police Force (CRPF) personnel from Jammu to Srinagar was traveling on National Highway 44. The convoy was carrying a large number of personnel due to the highway having been shut down for two days prior. On crossing Pulwama district, one of the convoy carrying security personnel was rammed by a SUV full of explosives. It caused a blast which killed 40 CRPF personnel of the 76th Battalion and injured many others. 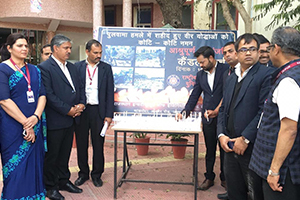 The incident left the entire nation shocked and numbed in deep sorrow. 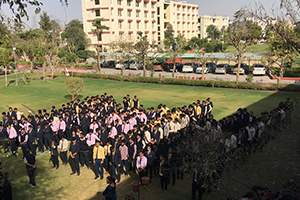 After the peace march all the students, HODs, faculty members and staff again assembled in the mini-lawn of RIET and held a two minute silent prayer in the memory of the brave hearts. 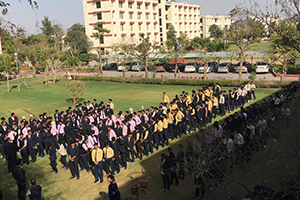 After the prayer, candles were lit in the memory of the slain soldiers, and each student, faculty and staff paid a sorrowful tribute to them. 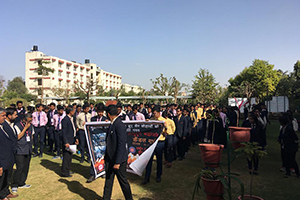 Speaking on the occasion Principal RIET Dr Saroj Hiranwal described the assault as an attack on India’s soul and said and said the entire country is with the brave soldiers’ families. She said that the martyrdom of these soldiers can never be forgotten. 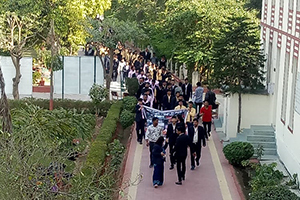 Dean Academics & Admin, RIET, Prof. Kapil Dev Sharma who led the peace march said that such an act of cowardice will never shake the confidence and lower the morale of our forces and countrymen. Our forces are courageous and the entire country is proud of them. 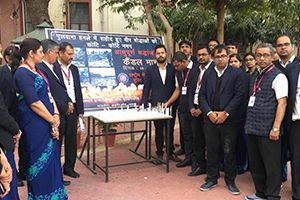 Dr Sachin Sharma, Vice Principal RIET, said that RIET is with the family members of martyred jawans at this moment of grief. Prof D D Johari, Advisor T&P said that, we condemn this barbarous attack in one voice and we will strengthen our resolve to fight this menace. 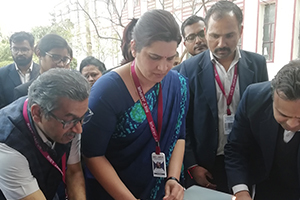 RIET NSS coordinator Mr Dinesh Swami, Asst Professor CSE, along with Event coordinator, RIET Ms Jyoti Khandelwal, Asst Professor CSE, systemized the entire occasion which was attended by all the students, faculty members, HODs and staff of RIET. The day ended with a great feeling of grief and patriotism.